I don’t know what it is about December 23rd, but for several of the last few years the date has contained events worth remembering. In 2010, it was the day I went to see the new True Grit film with my father (which would end up being the last thing we did together before he passed less than a month later.) In 2011, I had a remembrance lunch with my friend Brad at Brewburger (my favorite burger joint, which has since closed.) In 2014, I ventured to Pawhuska to enjoy lunch with my uncle at Sally’s Cafe, a restaurant run by a 98 year old Osage woman (who celebrated 99 by finally retiring, by the way.) This year, I didn’t really have anything major planned, but I did have the day off — so I decided to go for a drive. Seeing as how it’s almost Christmas, I decided to head for a town known for its Christmas decor: Tonkawa. They string numerous rows of garland across Main Street and have a tree in the center of town. Though I’d been to Tonkawa before, I hadn’t really appreciated their festive display the last time through. It would also serve as a good excuse to take alternate roads (both there and back) so I could drive through some more small towns I’d yet experienced. As I cruised west on Highway 412 at 7:30 AM, it occurred to me that I would be near the town of Perry at breakfast time; I could definitely stop for a bite at the Kumback Cafe. 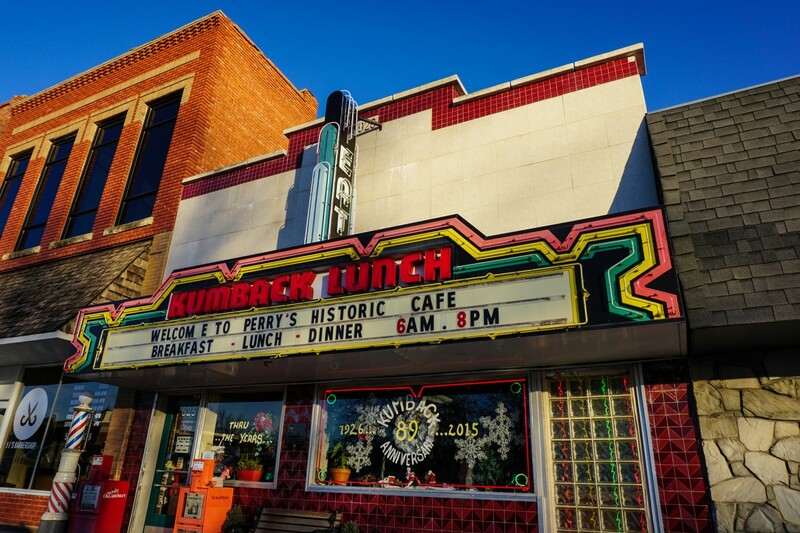 The Kumback Cafe (or the Kumback Lunch, depending on who you ask) sits on the north side of Perry’s town square with welcoming signage and bountiful neon. It’s been in business since 1926 and claims to be the oldest Oklahoma restaurant with the same name in the same location. It’s also said that gangster Pretty Boy Floyd cleared the place out to enjoy a solitary steak dinner back in the 1930s. When I arrived, there were no gangsters dining…but the place was packed with locals. I sat at the counter next to a row of old men – regulars – and ordered my usual eggs-and-bacon breakfast as they debated the news of the day. I once again admired the decor (I visited in early 2014 for lunch service) and it wasn’t long before the man next to me struck up a conversation. When I mentioned I was from Tulsa, he started telling me about coming to town to play at the casino. Though gambling makes my stomach turn, I listened to him tell me all about his adventures at the Hard Rock while I enjoyed my meal. He was very enthusiastic and it sure beat a political discussion. Satisfied with my food and service, I wandered town square for a few minutes before getting back on the road. The wind cut RIGHT through my fleece jacket and reminded me that, in spite of the 60-degree temperatures, it was still December. 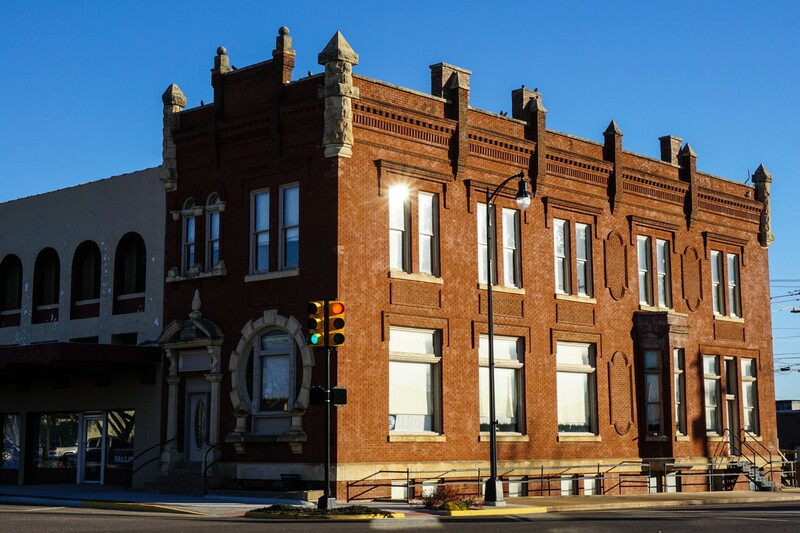 My favorite structure in Perry is known as the Foucart Building; it was built in 1902 and originally housed the First National Bank. The architect designed many of the buildings in Guthrie, which I’ve raved about before, so it’s natural that I should love this building too. I happily snapped photos until I nearly froze in the brisk wind. Once I was back in the confines of the Mustang, though, it was almost too warm for the jacket. Such is an Oklahoma winter. 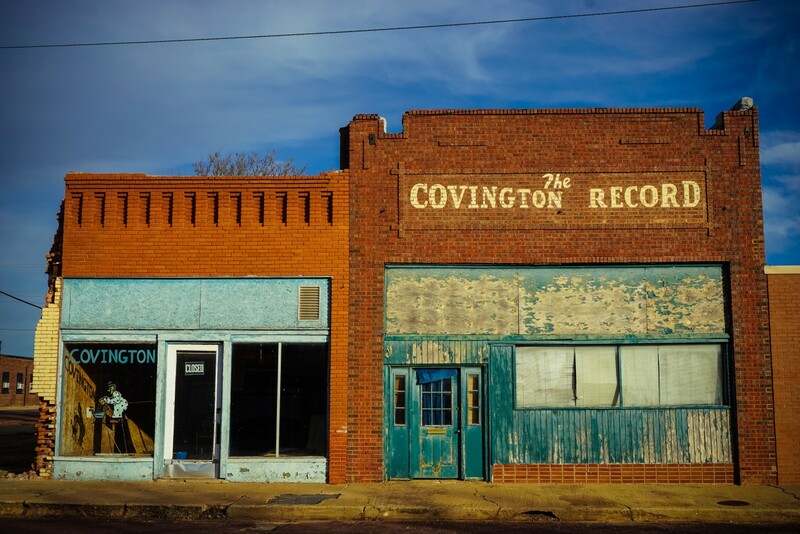 The next town I rolled through was Covington, and there wasn’t a whole lot there to speak of. Main Street was brick paved, and the only open business in their ‘downtown’ was the post office. One of the old store windows had a ghostly ‘Merry Christmas’ etched on it from some season past. Across the street, a shuttered brick building advertised the Covington Record, a newspaper that I’ve been unable to dig up much detail. It was established in 1916 and was sold in 1957 but I’m not sure if it published beyond that transaction. Interestingly, the ghostly main street still had some Christmas decorations scattered about the light poles. I guess the folks that live there do what they can with what they have. Grain silos dotted the horizon as I continued west to Enid. Enid is another town I’ve been to before, but last time through wasn’t much more than a pass-through. This time I didn’t stay long, either, but I did stop and wander a little. I bought some coffee from a local shop (Five80 Coffee), admired the Art Deco Broadway Tower (built in 1931 and seems to have had some work done recently) and drove around the Garfield County Courthouse. Town Square was a bit more spread out than Perry was, and the wind was still so biting that I limited my walking time…but there was one place I deliberately sought out: a mural by Rick Sinnett. 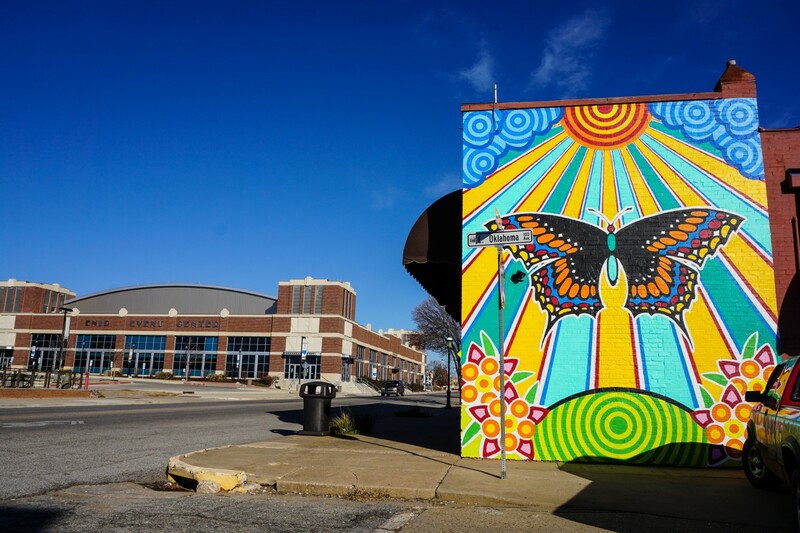 I have been seeking out his work throughout the state and was delighted to find his “Butterfly Project” mural on the edge of downtown. His work is so colorful it almost hurts. He has a whole series of murals on Route 66, including my favorite “Guardian of the Mother Road” in El Reno. After making a few more passes around downtown to ensure there wasn’t anything I absolutely had to stop and see closer, I headed northeast. My next stop was just north of Pond Creek, where a round barn sits proudly next to Highway 81. Unlike the Round Barn in Arcadia, this one is on private property…though it’s easy to see from the road. After driving east for a short while, I finally arrived in Tonkawa. As advertised, the downtown was covered in wreath lines. The tree in the center of Main Street was massive, and the wind had quieted enough I could walk up and down the street in relative comfort. On the east end of downtown I wandered into a little park in the shadow of the town silo, proclaiming Tonkawa as the Wheat Heart of Oklahoma. I’m not entirely sure what that means, but they are very proud of the title and it’s even emblazoned at the top of the silo. The town itself is pretty active for its size, with most storefronts open and active. Mom told me a while back that when my father was young, he would come to Tonkawa and hang out at the town college so I made sure to take a quick look around campus before heading to Blackwell. I’d been through Blackwell before, too, but I made sure to stop and take my time. I’m glad I did; I found an old train station! As I was snapping photos, a single locomotive came down the track, backwards, with no cars attached. It was the strangest thing. The last few towns I drove through were small and mostly uneventful occurrences. Braman to the north was much like Covington and was barely holding it together; Shidler to the southeast was a little better, but I noticed several buildings on the verge of collapse. The bright spot was a truss bridge I discovered just south of Shidler. 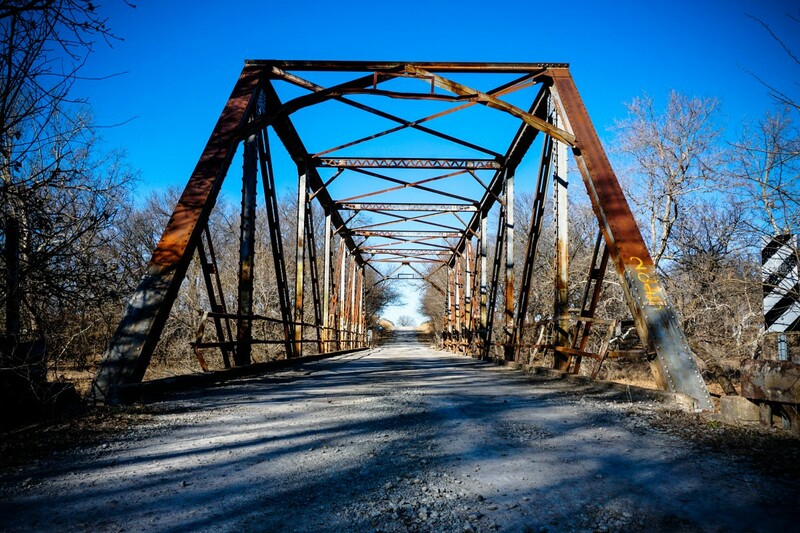 I had the place to myself as I wandered a rural gravel road and not just one but TWO bridges; there was a closed pony truss that was an easy walk down a shrouded lane. Even though it was only 3:00 PM, I could feel the light starting to wane. I headed for home, weaving around dozens of wind-powered turbines on two-lane county roads. The road home took me through Pawhuska, which I just visited on Sunday for a Christmas celebration with Dad’s side of the family. Since I still had a tiny bit of time, I decided to stop by the cemetery. I hadn’t been since Easter, I think, and felt it would be appropriate given the season and the significance of the date. As I got closer, I could feel myself tensing up but ignored it. By the time I arrived at the cemetery, parked, and walked to my father’s grave I felt like a teapot about to boil. I knew as soon as I opened my mouth, my tenuous hold on my emotions would evaporate…which it did. I wasn’t there long, maybe fifteen minutes, but I shared all of my good news from 2015. It’s been an amazing year, both professionally and personally, and my emotional outpouring was a mix of grief and gratitude. It was harder than I expected, but I’m glad I stopped. It was a good day; nine hours on the road and about 350 miles on the odometer; it’s a great little trip to wrap up the year. In the coming weeks, I’m going to sit down and go through all of my work for 2015 and put together a compilation video where I talk about the pictures that meant the most to me, much like I did for 2014. I’ll be sure to share that with you all once it’s finished. Thank you so much for following my adventures and sharing in my passion. I can’t wait to see what 2016 brings! 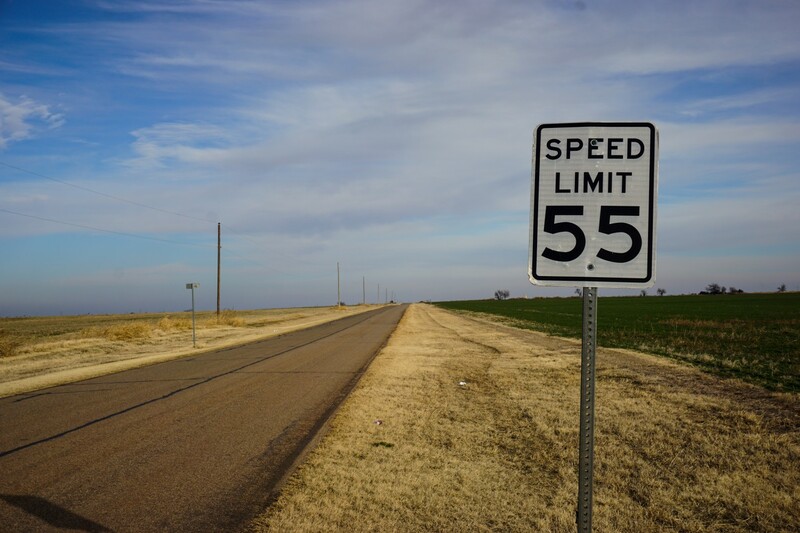 This entry was posted in Oklahoma, Travel, Uncategorized and tagged Blackwell, Covington, historic, Kumback, oklahoma, perry, road trip, rural, Tonkawa, travel, travelok. Bookmark the permalink. Iced in here and going through my emails. Glad I took time to read your posting. I love the town squares that many of our little towns have–Perry and Enid. You got a lot of traveling into one day and Christmas is a good time to do that since every town has its own flavor for Christmas. Ponca City is another great place to visit over the holidays. Looking forward to your 2015 review. Happy New Year. Ponca is on my list of ‘spend more time’ towns in Oklahoma! Rhys, you must be my little brother from another mother!